Ladies, just when you think you can't love Common anymore he goes and does something like this. Thanks to my DVR, I had the pleasure of watching 'COMMON DREAMS: A CNN Freedom Project Documentary' last night. In the documentary, COMMON DREAMS: A CNN Freedom Project Documentary, the rapper explored the world of the 'restaveks' in Haiti. Let's just say I cried through the majority of it. We owe the people of Haiti so much, but yet we allow them to live in abject poverty and squalor. The documentary was very eye opening for me. I've never heard of the practice of 'restavek', but now that I am aware it is my duty to spread the information. I also can say that through the documentary I gained a new She-ro and her name is Fabiola Desmont. 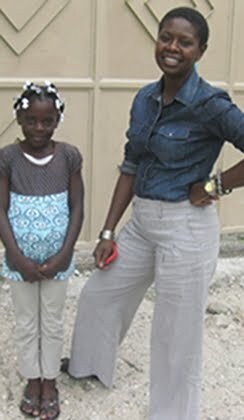 Fabiola runs the 'Restavek Freedom' organization in Haiti. She is truly an angel on earth and Lord knows if we had more people like her what a world this could be. Haiti is a nation with a dramatic beginning and a disturbing secret. The world’s first black republic was created by slaves who rebelled against their masters in order to create a better future for themselves and their descendents. But 200 years later, that promise of freedom still eludes many Haitian children, who are today living in a form of abuse and exploitation known as ‘restavek.’ A French word meaning ‘to stay with,’ restavek began with the intention to educate children from rural villages. Unfortunately, many restavek children today are forced to work long hours in other people’s homes, cooking, cleaning dishes, doing laundry and fetching water. Worse yet, many of these children are not even allowed to go to school. Common travels to Haiti to see this hardened practice rooted deep within the culture. He learns of the premise on which the system began and comes to understand how a devastating earthquake and decades of despotic rule have eroded the restavek concept. Common meets the children, their ‘guardians’ and a team of dedicated people determined to change cultural perceptions and provide them with a better life. In the process, his team helps convince a family to give a little girl what she so desperately wants: the chance to go to school and dream of a better future. Earlier this year, CNN announced it was marshalling its global resources to take on human trafficking with the launch of ‘The CNN Freedom Project: Ending Modern-Day Slavery.’ Through this multi-platform initiative, CNN’s reporting aims to expose the horrors of modern-day slavery, highlight the growing efforts to stop the trade and exploitation of human beings and amplify the voices of the victims. Thank you Common for taking that time out to see for yourself what the update is over there. May GOD bless your heart & your hands. One Love!!!! We ARE ALL ONE PEOPLE no matter what nationality you derive from. Fabiola, Se pou Bon Dieu proteze! Beni Soi L’ternal!!! Benedicion Million percnt!! COMMON, I pray that the (ex)in-sperience that you've encountered in Ayiti (Haiti) gives you more strength to continue sharing the word with your fans & the world for that matter, so that it can be known that it takes the PEOPLE to make a difference. We definitely have to count our Blessings & give thanks to GOD. It's REAL out there! That can not be sugar coated. It make you want to keep questioning, Where are the assistance that they claimed they sent for the people? (repeated question, still no answers) To GOD Be the GLORY!! !